Art of astronauts conducting sample analysis on Mars. CAMBRIDGE, Mass. — Apollo 11 moonwalker Buzz Aldrin wants to send people on a trip to Mars, and he doesn't want them to come home — at least not at first. The time and resources that will be used to get humans to the Red Planet only make sense if the astronauts stay there and help to jump-start an outpost on the new world, Aldrin said during a panel here at MIT's AeroAstro 100 conference Wednesday (Oct. 22). "It [will] cost the world — and the U.S. — billions and billions of dollars to put these people there, and you're going to bring them back?" Aldrin said. "What are you going to do when you bring them back here that can possibly compare [to] the value that they would be if they stayed there and Mars wasn't empty? And then, they helped to work with the next group and it builds up a cadre of people. When we've got 100 — or whatever it is — then we start bringing people back." Buzz Aldrin, Karol Bobko, Vance Brand and Walter Cunningham sit on a panel at MIT. The organization Mars One is planning on launching a one-way trip to Mars in order to begin establishing a colony on the Red Planet by 2025. 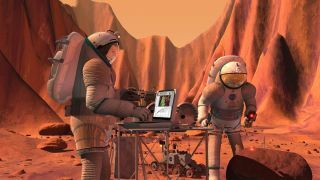 The spaceflight group has more than 200,000 applicants willing to fly to Mars, but a study from MIT recently found that the Mars One plan might not be entirely possible. Growing food and harvesting oxygen would be major obstacles that Mars One would need to overcome before launching on a trip to Mars. "We're not saying, black and white, Mars One is infeasible," study co-author Olivier de Weck, a professor of aeronautics and astronautics and engineering systems at MIT, said in a statement. "But we do think it's not really feasible under the assumptions they've made. We're pointing to technologies that could be helpful to invest in with high priority, to move them along the feasibility path."